Few things in sport are as sad, are as poignant, as watching an adored individual or team suffer a historic fall. To this day, there persists a feeling of resentment towards Larry Holmes after he beat Muhammad Ali into submission, and closer towards retirement, in Las Vegas on 2 October 1980. In 2009, American golfer Stewart Cink could hardly have been a more begrudged winner of the British Open after cruelly denying veteran countryman Tom Watson a late-career miracle at Turnberry in a playoff. Football, so enamoured with underdogs and giant-killings, nonetheless holds its own fair share of unpopular upsets. West Germany are responsible for two of the most lamented results in World Cup history. The first, the dramatic final of 1954, saw a Fritz Walter-inspired Die Mannschaft overcome the Mighty Magyars of Hungary 3-2 in what remains the biggest shock in a World Cup final to date. There also remains a gnashing of teeth among so-called football purists in knowing that Johan Cruyff’s Total Football-playing Netherlands were beaten by the, in hindsight only, equally brilliant West German team in the 1974 World Cup final. In the most meaningless of consolations, Hungary 1954 and Holland 1974 are two of the three teams often cited as the greatest never to win the World Cup. Completing that particular cherished trinity is the Brazil team of 1982, and it was Italy’s footballers, and one forward in particular, who are responsible for one of the most notorious fantasy-crushing shocks of all-time. At the 1982 World Cup in Spain, the Italians, emerging from a domestic match-fixing scandal, barely looked a team in the group stages, never mind one set for glory. Paolo Rossi, the brilliant forward who had emerged four years earlier in Argentina, was back after a two-year ban and his inclusion in the squad had led to rife criticism of coach Enzo Bearzot. Three group matches had resulted in three uninspiring draws: a 0-0 against Poland and a couple of 1-1 ties against Peru and Cameroon. Rossi was dire, nowhere near justifying Bearzot’s faith in him. Seemingly carrying an unhealthy burden of expectation, he was a shadow of the 20-year-old who had thrilled the watching world in Argentina, scoring three goals as Italy finished fourth. Regardless, without Rossi’s, or anyone else’s sparkle, progress from Group 1 was secured only on goal-difference, though it seemed barely worth the trouble for Bearzot’s team as they were, in a bizarre tournament format, placed in a three-team group with reigning champions Argentina and a sensational Brazil. A narrow 2-1 win over an Argentina team that pulsed with the presence of a young Diego Maradona, inspired by a legendary defensive masterclass from Claudio Gentile, ensured a winner-takes-all clash against Brazil on 5 July at the Estadi de Sarrià in Barcelona. It would prove one of the greatest days in Italian football history and, against all odds, along with prevailing evidence, the pinnacle of Rossi’s career. The Juventus striker had barely looked like scoring in the previous four matches, and few would have imagined he could trouble a gifted Seleção that included the stellar talents of Júnior, Falcão, Sócrates, Éder and the peerless Zico, and that was expected to march triumphantly to the title in Madrid. But nobody had accounted for one of the great goal-poaching performances of all time. Only five minutes into the match, Rossi got onto the end of Antonio Cabrini’s pinpoint cross to head Italy into a shock lead. Brazil, like most expecting the Italian to employ spoiling tactics, were stunned. 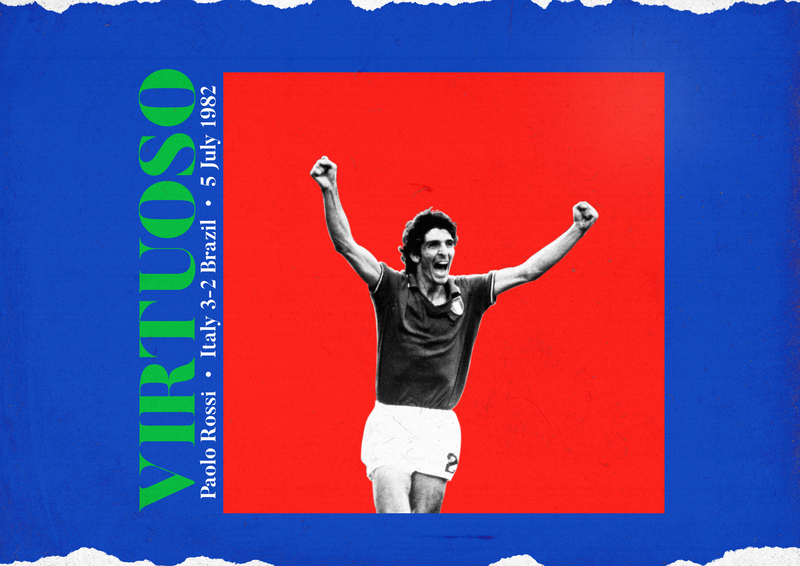 Against the USSR and Scotland, in the group stages, Brazil had recovered from falling behind early to win, so there was no need to panic just yet, and recover they did just seven minutes after Rossi’s opener. Sócrates and Zico were involved in a wonderful passage of play before the former beat the 40-year-old Dino Zoff from a tight angle. It seemed normal service had been resumed. Yet a typically cavalier Brazilian approach to playing out of defence saw a loose Toninho Cerezo pass pounced on by a suddenly resurgent Rossi and his deadly right-footed strike gave Italy the lead at half-time. A slightly unnerved Brazil dominated the early stages of the second half and equalised through Falcao’s wonderful left-footed strike on 68 minutes. Needing only a draw to progress to the semi-finals, Brazil’s march to glory was back on track. But there was to be one more twist and inevitably it came from Rossi. With 15 minutes left, Bruno Conti’s corner was only partially cleared by the reckless Brazilian defence and Marco Tardelli’s shot was instinctively steered home by Italy’s number 20, completing what in the ensuing years would become the most fabled of hat-tricks in Italy. Now it was time to panic for Brazil. Telê Santana’s team needed to recover for the third time in the match. But, in the scorching Barcelona heat, that would prove beyond the team that the world had fallen in love with. In a matter of 90 minutes, Italy’s players, inspired by a once-in-a-lifetime individual performance from Rossi, had pulled off a result that still astounds decades later. Things would get better for them. Rarely does a team go on to win the World Cup having been considered such massive underdogs in a particular match, West Germany’s against Hungary in 1954 excepted. But Italy did just that. A semi-final against Poland was easily won 2-0, both goals coming from the unstoppable Rossi, who also scored the opener in the 3-1 win over West Germany in the final. The man who couldn’t buy a goal in four matches had scored six in three to finish as the tournament’s top scorer and best player. To this day, faded photos of Rossi and his teammates still hang on the walls of pizzerias and cafes across an eternally grateful nation. 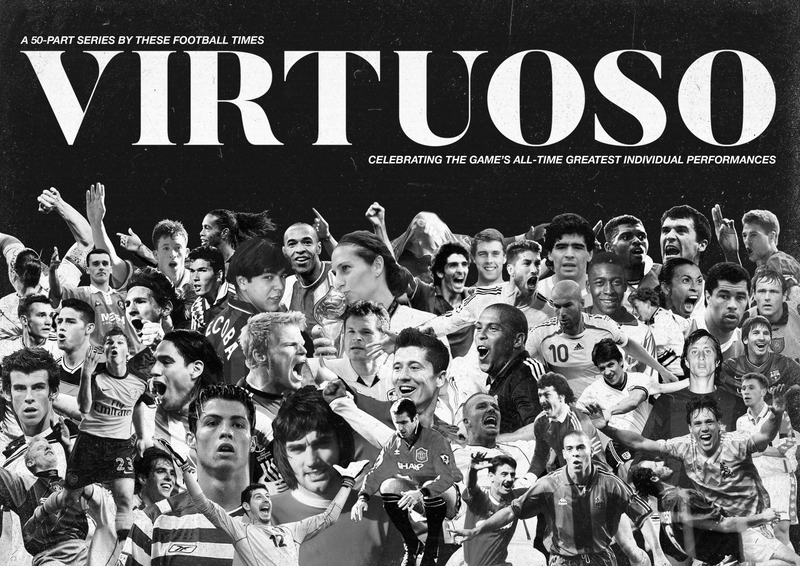 In Italy, Rossi’s heroics against Brazil are unmatched in the hearts of football fans. The same can’t be said for so many outside it.